True story: The mother of a 16-year-old boy was coming down the long driveway to their home when she saw her son. He was standing in the back of a pickup truck, holding onto a rope (presumably attached to something on the truck), wearing some sort of small parachute and a football helmet. He explained that he was going to parasail behind the truck. “But don’t worry, Mom. I have a helmet on, so it will be OK.” Welcome to the wonderful world of teenagers. Frances Jensen and Amy Nutt have provided a clear, understandable overview of some of the behavioral and neurological issues that parents and teens face today. Although the subject matter often gets quite technical, the book does not get bogged down in heavy scientific terminology, but is accessible to a wide variety of readers. 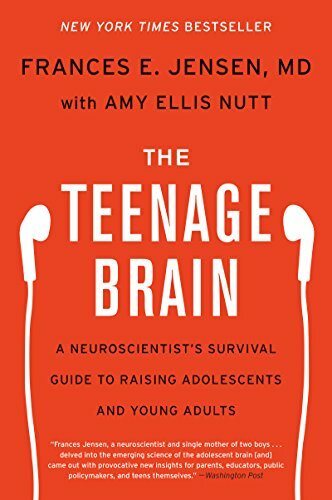 The writers explore the relevant medical and scientific literature to give the reader an excellent picture of the teenage brain (often using a literal picture). Jensen’s neurological expertise is complemented by the fact that she has raised teenage sons. Often, the scientific narrative has personal examples embedded in it to help understand a given situation and allow it to escape what could often be a rather dry description of an issue. The basic thesis of the book is a detailed description of adolescent brain development as a work in progress. Some components of the brain (the neurons that form the basic building blocks of the brain) are available in excess, while the white matter (the connections between one part of the brain to another) are in short supply. Modern brain imaging techniques allow detailed mapping of brain function. Among other things, studies show that the frontal lobes (associated with judgment, insight, and planning) are the last areas to connect in adolescence and young adulthood. So their ability to control impulses and moods has not yet developed fully. Mood swings, irrational behavior, risk-taking—all of these behaviors are a consequence of this lack of development. Jensen and Nutt explore a number of topics that concern parents. They look at addictive issues (tobacco, alcohol, drugs) and explore the neurochemical processes that facilitate addiction. Of special interest is the chapter on marijuana. To date, two states (Colorado and Washington) have legalized sales of marijuana, with Oregon and others taking a close look at doing the same. The authors provide a wealth of information about the adverse effects (both short-term and long-term) on the brain. Marijuana se is not the benign practice that it may have once been (if it ever was benign) and the authors point out the many problems being seen with today’s use of the drug. A significant concern for both parents and educators is the seeming lack of sleep obtained by teenagers. There is a large amount of literature describing how teens go to sleep later and wake up later. A number of recommendations have been put forth arguing that school classes should start later to allow teens to get enough sleep. Jensen and Nutt summarize the relevant literature that would end to support this position, but then (inadvertently?) undermine their argument by describing research that shows clearly that many teens are involving in texting late at night, staying awake in the process. Another related issue deals with the amount of exposure to computer, tablet, and phone monitors—prolonged exposure can alter melatonin production and have a profound influence on sleep patterns. Obviously, this issue still remains unresolved. One challenging issue today has to do with the question of responsibility for one’s personal behavior. The chapter “Crime and Punishment” explores a number of legal and ethical issues related to the treatment of adolescents as law-breakers. In many states, teenagers often receive the same jail sentences as adults do, even though it is becoming more and more apparent that the teen impulse control issues are very different from those of adults. Case histories are described that look at specific situations and ask some perplexing questions. As is the case with mental illness, if the teen has diminished capacity for rational behavior because of his or her still-developing brain structure, what then is the just and equitable solution to punishment and rehabilitation? The Teenage Brain is a valuable resource for parents, youth workers, educators, and anyone involved with teens in any way. The book is engaging, understandable, and extremely informative.